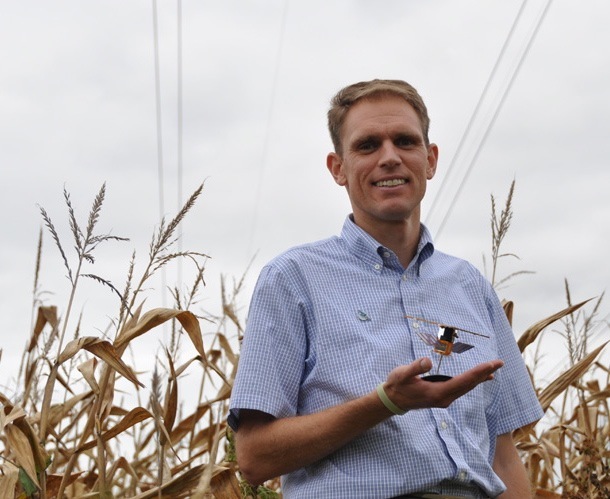 Brian Hornbuckle is trying to improve crop yields and predict flooding by measuring soil moisture – from space. Hornbuckle, an associate professor at Iowa State University, has a unique way of understanding how the world works and how we might keep it working. He is a physical agronomist– a term he coined. It means that he uses physics to study how plants and soil interact with climate. But throw in his expertise in satellite design and data collection, and the work gets even more interesting – interesting enough to land a role in a European Space Agency project he calls “groundbreaking” and “a perfect fit” for his hodge-podge of interests. With a young face and wiry frame, Hornbuckle looks like someone who cares about the environment, but not an activist. Maybe an Eagle Scout. (He dabbled a few years in the scouts, but never reached the rank, he says.). His short sandy-brown hair, is parted on the right side, and his digital wristwatch compliments a wardrobe of short-sleeved collared shirts and creased khakis. 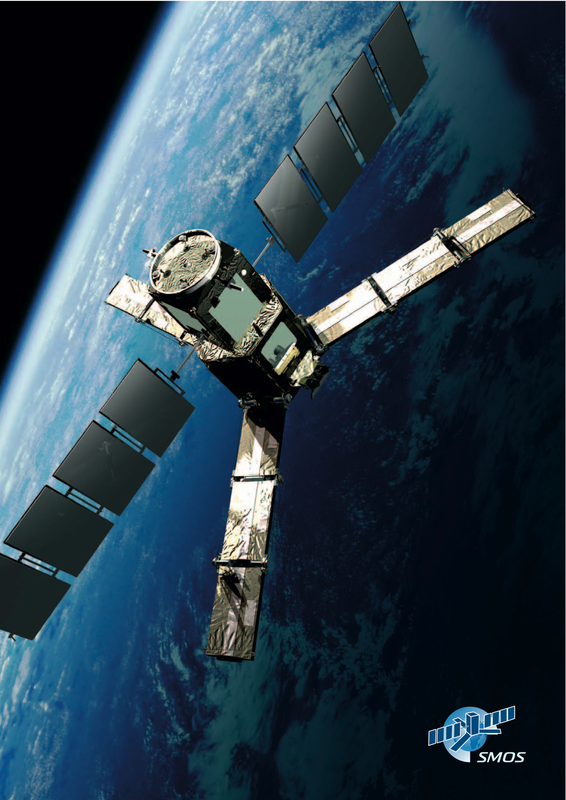 Hornbuckle now leads a team in Ames that analyzes data from SMOS (Soil Moisture and Ocean Salinity), a satellite, launched last November, that uses microwaves to measure soil moisture on earth. With the images SMOS sends back, researchers hope to develop real time models to predict flooding and pollutant levels – information that could one day help communities better prepare for disasters or increase crop yields. 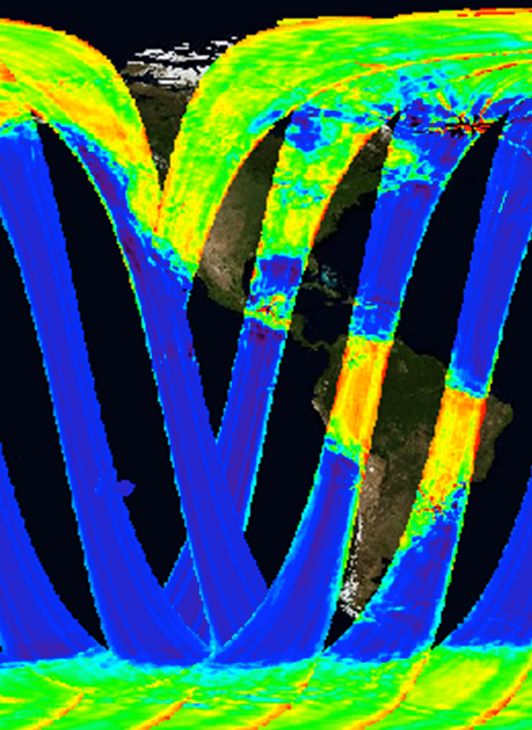 A realistic illustration of SMOS as it orbits the earth. It sees each spot on earth every 2-3 days, measuring the soil moisture. - image provided by Brian Hornbuckle, via the European Space Agency. As it orbits, SMOS sees each point of the globe every two to three days, with a resolution about the size of an Iowa county, Hornbuckle says. His job is to help check the satellite’s work. So on a square kilometer plot of land, a corn-soybean rotation just south of Ames, his team performs ground experiments to verify that measurements from the satellite match what is happening on earth. The researchers also make models that translate the raw signal SMOS transmits from space to units of soil moisture and water salinity. “It’s great to be involved in validation projects like this because that’s where the theoretical science meets the real world,” says Amy Kaleita, an assistant professor in agricultural and biosystems engineering at Iowa State, who helps Hornbuckle monitor soil moisture. To succeed in making those theories work, Hornbuckle needs to know what’s going on in space and on the ground. The novelty of that idea is not lost on Keri Hornbuckle. “Isn’t it cool that the tools of a space scientist can be applied to dirt?” she asks. Hornbuckle didn’t dream of becoming a physical agronomist as a child in Shenandoah, a small town in Iowa’s southwest corner. Heck, he didn’t know the field existed. But he liked math and science, he says, so he majored in electrical engineering at Brown University, and graduated in 1994. After that, Hornbuckle joined the Mississippi Teacher Corps and taught high school physics and chemistry in Clarksdale, Miss. On November 20, 2009, SMOS sent this image, it's first, back to earth. - image provided by Brian Hornbuckle, via the European Space Agency. But as he entered University of Michigan’s doctoral program for electrical engineering, he had yet to explore his interest in the environment. Luckily, his advisor showed him a field that would accommodate all of his interests. Anthony England, a former NASA astronaut, who had tried but failed to launch a SMOS-like project called Hydrostar in the 1990s, saw that Hornbuckle was a perfect fit for the field. “The light bulb kind of came on, like boom – this was what I really want to do,” Hornbuckle says. Hornbuckle said he loves studying the Iowa environment, but he worries about the state’s future. “There’s a need for people to understand how changes in climate as well as the increased pressure to produce both food and fuel will affect Iowa’s agricultural systems,” he said. Environmental experts say we have already seen those consequences in the form of more extreme weather, including flooding. The past 36 months have been the wettest in Iowa’s 136 years of record keeping, bringing floods that have driven thousands of people from their homes and caused millions of dollars worth of damage across the state. And last summer, 57 of Iowa’s 99 counties were declared disaster zones. But still, Hornbuckle is optimistic about what his research will yield, and his cousin believes in him too. “He’s an awesome scientist,” Keri Hornbuckle said.